The first is a great comforter from Trend Bites. I can see this made from some scarves from the thrift store. I'd love to try that! This is really cool wallpaper over on Apartment Therapy. 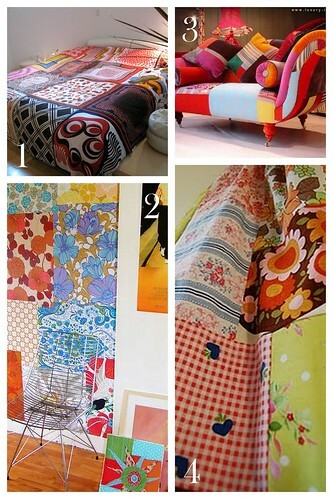 I would love to DIY my own patchwork chair or couch & this is great inspiration from Pinaywife Atbp. Finally, this is a beginning shot of a project over on HandMaid Liset. I love the patterns!! Do you have a favorite pattern or are you digging patchwork as much as I am? just so you know, when I went to this post, it says the pictures are currently unavailable. Sorry! Hope it's easy to fix. Thanks for including my patchwork on your lovely, lovely blog! !